Northern hardwoods, especially along borders, trails, clearings, and rivers; meadows and ditches. The characteristic large cordate to reniform terminal segment of the basal leaves is a feature also sometimes occurring in G. aleppicum and G. rivale, both of which are therefore sometimes confused with G. macrophyllum. The head of achenes in G. rivale is elevated on a stalk, and the beak is conspicuously hairy though it may also be glandular; in G. macrophyllum the receptacle is essentially sessile, and the beak is only glandular-puberulent. The beak of G. aleppicum has only a few long hairs at its base. Both may have pilose achene bodies. 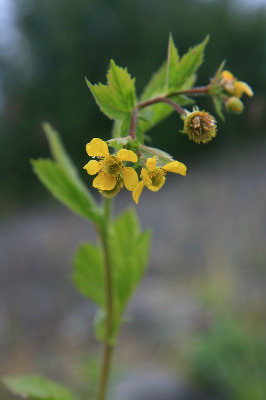 Two varieties are recognized by Rohrer (2014), The common Geum macrophyllum var. macrophyllum, with pedicels not glandular and cauline leaves with the terminal segment either simple or 3-lobed ( then divided less than 3/4 to base and with the lobes rhombic-oblong) and G. macrophyllum var. perincisum (Rydb.) Raup., with pedicels glandular and cauline leaves with the terminal segment trifoliolate or simple and 3-lobed (then divided almost to base and with the lobes oblanceolate to obovate). 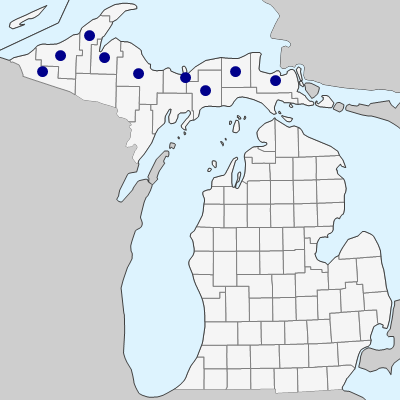 Michigan and the western Great Lakes region is a zone of overlap of the two varieties. Var. macrophyllum is known from throughout the Upper Peninsula and var. perincisum has been collected in Marquette Co.
A Dodge collection, June 12 1916, in BLH, is labeled "Vicinity of Port Huron," but Dodge's own herbarium at MICH contains a June 12, 1916 collection from Ontario by N. Tripp, and the BLH sheet is likely a mislabeled duplicate of this. MICHIGAN FLORA ONLINE. A. A. Reznicek, E. G. Voss, & B. S. Walters. February 2011. University of Michigan. Web. April 19, 2019. https://michiganflora.net/species.aspx?id=2487.